The exhibition features works by artists addressing themes of culture and ethnicity, survival, and the power of the human spirit in overcoming adversity. Four artists with different life journeys are telling stories through their paintings, prints and sculptures. This exhibition includes Chicago artists René Hugo Arceo, Mark Nelson, Yohanan Petrovsky-Shtern and ex-Chicagoan Peter Dallos. René Hugo Arceo was born in Cojumatlan, Michoacan, Mexico in 1959. He completed high school after relocating to the United States in 1979 and soon thereafter attended the School of the Art Institute of Chicago. From 1986 to 1999, Rene worked for the Mexican Fine Arts Center Museum in Chicago, helping it become the largest Mexican Fine Arts institution in the nation. 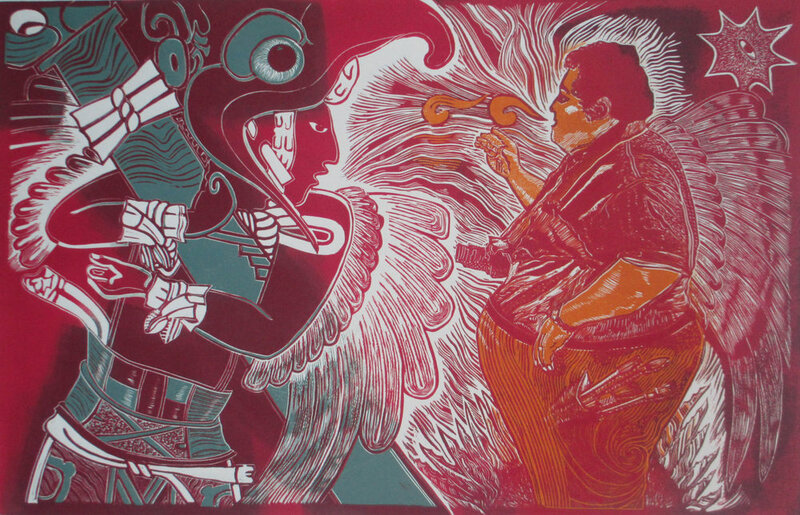 Arceo’s work has been influenced by the traditions of Mexican printmaking and by his regard for the work of Mexican artists. He is working in various relief print media with the themes of life and culture that surrounds him with the ancestral spirit lurking behind him. Peter Dallos spent his early years under the Hungarian fascist regime and later under the Soviet occupation. He immigrated to the U.S. after the Hungarian Revolution of 1956. His professional life has been in neuroscience research, currently as the John Evans Professor Emeritus of Neuroscience at Northwestern University, Evanston, IL. In 1998, he began making sculptures and has been a professional sculptor since 2012. In his “Struggle Series,” he is concerned with elemental conflicts that affect humankind. The semi-abstract sculptures depict the reaction of the wounded earth to environmental destruction. Alternatively, the work can be interpreted as showing the conflict between Western Civilization and the forces of nihilism and anarchy. Mark Nelson’s work was forged by his childhood experiences overseas. Raised as a Colonial American outside of the continental U.S., his international travels Culminated in a near twenty-year residence within the Republic of Panama where he developed an interest in visual and performing arts. Nelson returned to the USA to finish his formal education at the School of the Art Institute of Chicago, followed by a Masters in Fine Arts at the University of Illinois in Chicago. Eventually, Mark Nelson took up permanent residence in Pilsen, where he resides and works in his Gringolandia Studio. 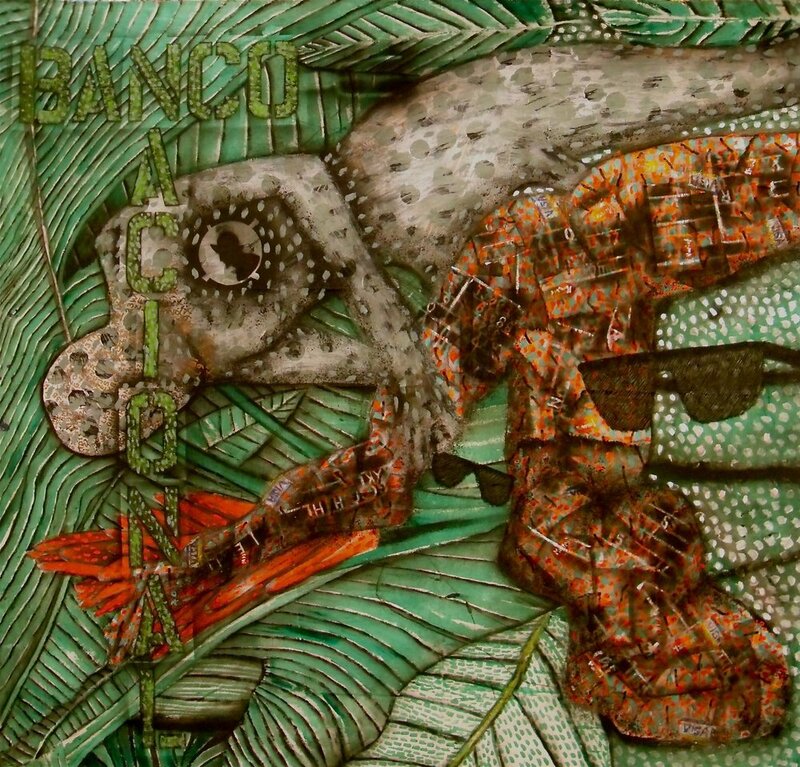 His new works from the “Panama Series” reflect the cultural and physical landscape that made it his home for nearly 2 decades. Yohanan Petrovsky-Shtern was born in the U.S.S.R. and grew up under socialism. He came to the United States in 1996 to study Jewish history at Brandeis University. In 2003, Yohanan joined the faculty of the History Department at Northwestern University, where he currently serves as the Crown Family Professor of Jewish Studies. In his “Nightmares Series” he is working with acrylic on canvas, in mostly three hard-edge color compositions, culminating in a final visual effect of powerful, paper-cut-like imagery. His themes are a combination of recognizable religious, literary and historical visual references. Yohanan addresses universal themes of catastrophe, violence, and fear which he represents through the prism of Jewish experience. Cost: Free. Donations are welcomed.